I read this book April 2012, I loved it and it is my favourite. This novel was a gift. What a book? My heart beat accelerated while I read it. 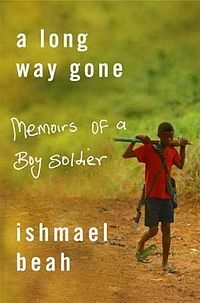 Ishamael Beah perfectly, simply and easily wrote a very difficult book, a story, uneasy and overwhelming. He is a story teller indeed. An easy, clear and very understandable read. 5 stars book for sure. How can one go through such terrible experiences even as a child? How can we be able to sleep if atrocities like this happens in some other part of the world in which we exist? I couldn't keep this book down, it tormented me even when I finished it. God knows, Ishmael Beah is one of the people that inspires me. Sierra Leon, what a beautiful country, the way nature was described in this book reminds me of paradise. Its richness in animals, trees, streams, rivers.... It is amazing. I heard about the war sometime in the past, sometimes I saw documentaries, I heard about it, but I had no idea it was as brutal as it was described in this book. This is a first hand story from a young fellow who has lived and survived the war. Fortunately for me, I lived war through this book and now, I get to appreciate my life more. There is nothing good war brings, if not to destroys. I highly recommend. As I earlier said, Ishmael Beah is my inspirational person. Laura Simms (His mother) I can't stop loving and admiring.